When coming to a pedestrian crossing with a raised traffic island in the middle, what must you do? When coming to a pedestrian crossing with a raised traffic island in the middle, what must you do? B. Stop and give way if a pedestrian is on any part of the crossing. Yes - you can carry on through the crossing if a pedestrian is not either crossing or waiting to cross on your side, as long as it's safe to do so. When coming to a pedestrian crossing with a raised traffic island in the middle you only need to stop if a pedestrian is on your side of the road. A raised central island is designed to protect pedestrians, to an extent. A simple raised island provides a refuge for pedestrians in the middle of the road. Sometimes, if the road is more than two lanes, the crossing will be staggered - the two crossings are not continuous, and the central reservation may be protected by a fence. Pedestrians approaching a pedestrian crossing must make sure it is safe to step out into the crossing before they do so. Once the pedestrian is on the crossing, vehicles must give way to them. 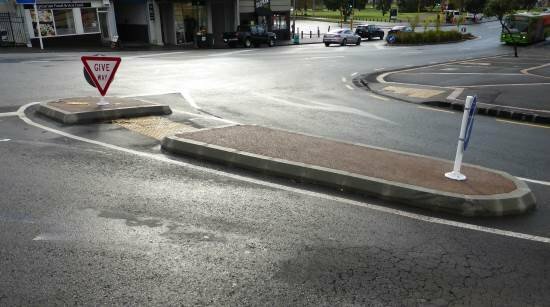 There are several types of pedestrian crossings including raised crossings, courtesy crossings, staggered crossings, crossings at traffic lights, and school (kea) crossings. Pedestrian crossings, which are called zebra crossings in some countries, usually have white stripes painted across the road. The approach to the crossing will often have a white diamond if the crossing is slightly obscured - note that that is different to some other countries which have zigzags or other road markings on the approach. There will also be a diamond-shaped yellow sign with a pedestrian crossing symbol. For a comprehensive guide to pedestrian crossings, click here to read our advanced guide to pedestrian crossings in New Zealand. 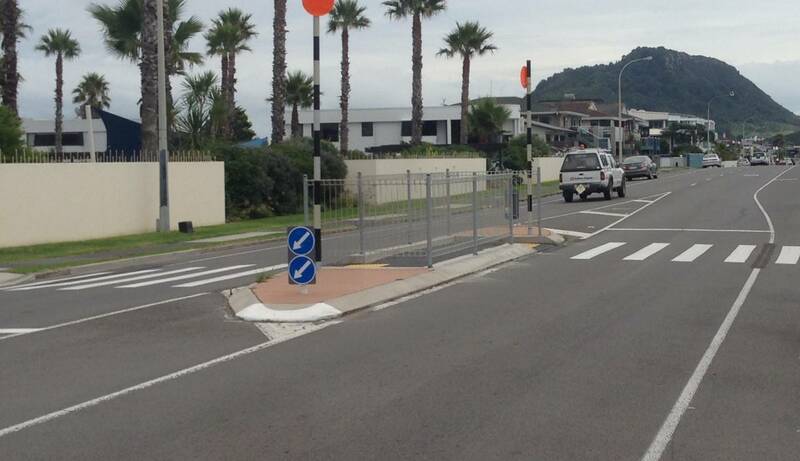 Raised islands can also be used when there is no marked crossing in order to give pedestrians a safer refuge. For example this image is on Scotland St outside the supermarket on College Hill, Auckland. Scotland St is quite wide and College Hill is busy with a lot of traffic turning into Scotland St to go to the supermarket. Tactile markers are used on the kerb edge and in the central reservation which has a gap in the kerb for pedestrians to pass through.